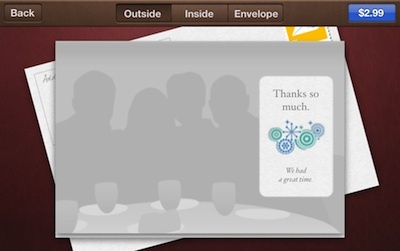 Amongst the announcements at the time of the iOS5 presentation was a app Apple released for creating cards on your iOS device using pictures you have on the device. Don’t have time to buzz to the store to buy a card, create one and have it printed/sent for you without leaving your iPad. We have covered a few options in the past. Each with their own unique speciality, from multi images on a card to ones that use images from your Facebook/Instagram pages. 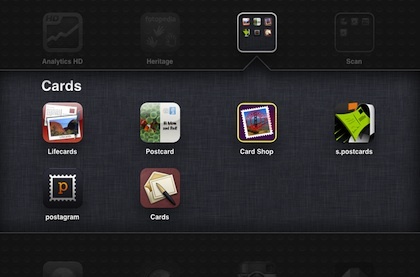 The Cards app is actually for the iPhone and not universal, yet. But, in 2x mode it is fine when you want to create a card on the go. Launching the app presents you with a row of templates to choose from. Just sweep through till you find the one with the right impact. At the bottom of the screen is the card templates sorted by areas like Birthday, Love, Baby, Travels, etc… or you can choose the ‘all’ to see the whole group. Many have frames around the image area, that frame or accent art is not editable. 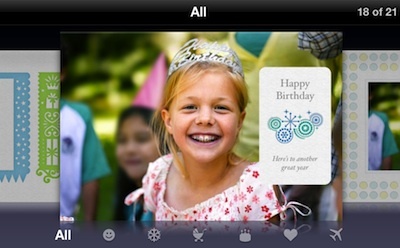 Instead of the demo image shown in the card selector, gray images show where you can place your photos. Just tap to bring up the selector to find an image from your iPad’s photo library. If you find you didn’t select the card you had hope, just tap the ‘Back’ button to go back to Card’s templates. Choose the ‘Inside’ from across the top navigation bar to enter your text over the default text if you want. Just tap to bring up the text editing window, even the headlines can be changed so a card for one purpose can be changed to match your needs. While not a limitation in functionality, the Card app does only work in landscape view. 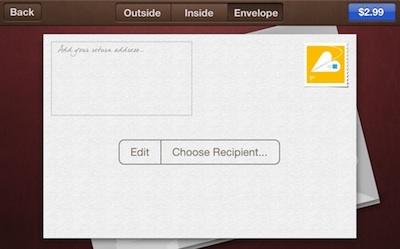 When the front and inside of the card is as you like, choose the Card’s envelope add the Recipients… then ‘pay’. 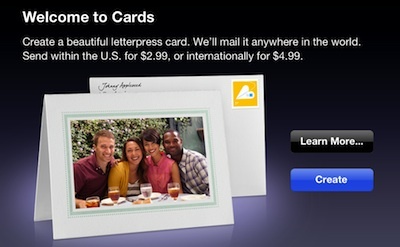 Apple’s services will print and send for you from that point. 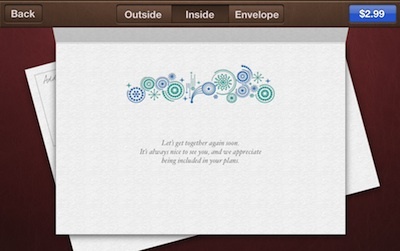 Many of us have played with the Cards feature within the desktop iPhoto software, the cards are pretty nice and folks always love getting mail.